The electricity that is powering your computer as you view this website has likely traveled a long path to get to you. Power is generated at facilities such as coal, natural gas, or nuclear power plants, hydro generation sites, wind or solar facilities, or others. After leaving generation facilities, voltage is increased so that electricity can be transmitted over long distances to population centers. The high voltage lines that carry electricity from generation sources throughout the electric grid are referred to as “transmission” lines. Transmission lines feed into substations, where voltages are reduced and power is distributed to lower voltage circuits. These lower voltage lines that leave substations and provide electrical service to residential and commercial customers are referred to as “distribution” lines. Due to their high voltages, transmission lines are designed with large separations between energized conductors. 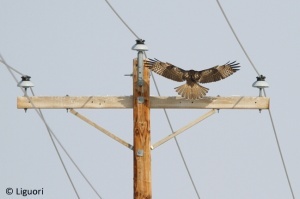 Therefore, transmission lines typically do not pose bird electrocution risks. 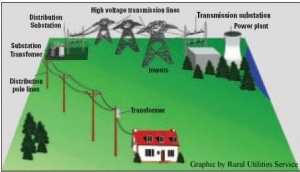 Transmission lines may be configured with energized conductors below and an overhead grounding conductor, or “static wire”, above. This static wire is often a thinner diameter than the energized conductors, and may pose a bird collision risk in certain habitats or for certain species. Distribution lines, unless constructed using avian-safe (see Frequently Asked Questions for definition) framing, have closer spacing between conductors and may pose bird electrocution risks. Bird collisions may also occur with distribution lines in certain habitats or for certain species. 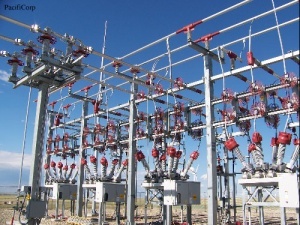 Some substations may pose bird electrocution risks, depending on the voltage and spacing. 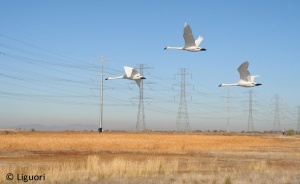 Like power poles, the higher, transmission voltage sections of substations, are typically framed with adequate separation to protect large birds. However, the lower, distribution voltage sections of substations may pose electrocution risks. While substation retrofitting is more costly and complex than pole retrofitting, numerous manufacturers design bird protection products for substations. Some bird species may construct their nests on electrical facilities. 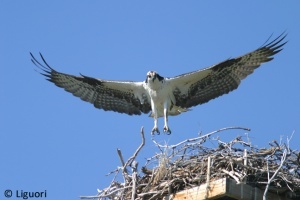 Depending on the nest location, nest size, and pole configuration, nests may pose pole fire or outage risks, as well as electrocution risks to nesting birds. Utilities often erect nesting platforms to provide raptors with nest locations that are safer to both the birds and the electrical system. Pictured below: Swainson's Hawk nest on cutout/arrester arm, with disconnected equipment (left), Osprey nest on platform (right). For more information on bird electrocutions, see Electrocutions. For more information on bird collisions with power lines, see Collisions. 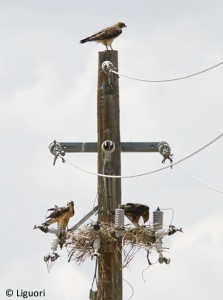 For more information on bird nests on with power poles, see Nests.